Forbidden Desert is a very fun game full of tragedy, despair, exultation, exhilaration and dehydration. There’s a lot to like in its tin, which is why we gave it four stars. What we want to know now though is if you like the sound of it as a game could you too take with you as you die in the desert? Let’s find out. We’re all the same colour under our skins – bleached bone, drying in the hateful sun. It is however not hugely significant – there are a few overlapping colours, but the pawn you have is the only thing in the game that requires you to differentiate it. As with Pandemic, you can solve the issue by decoupling pawn colour from card colour, or using a token from another game. There is a small issue that comes with signalling the presence of roles when you do that, but it’s unlikely to be something that seriously impacts the game in the same way as with Pandemic. In that game, it really matters that you have a medic in a particular city. In this one, it helps to know who is where but it’s rarely vital to success or failure. 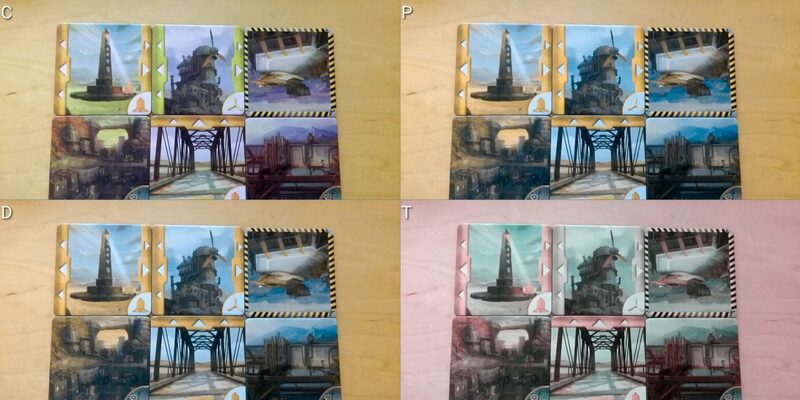 The game itself looks fine for most categories of colour-blindness, and while the art of the game is lovely it’s not something that is fundamental to its appeal. You spend most of the time with the tiles flipped down, and a lot of the rest of the game with sand-markers obscuring the art. We’re happy to recommend Forbidden Desert in this category, if you are willing to make a few substitutions of tokens. So pretty. It is a pretty little game. There is very little text in the game, and very little that needs complex visual parsing. The sand markers are tactile objects, which means that even those with severe impairments or a lack of binocularity can finger through the stacks to count how heavy the sand build-up is. Similarly with tracking game state – the flying machine is a tactile object which can be interrogated easily for which have parts have been attached. There’s a lot to like here. The largest issues comes in though with the symbols on the cards – while they’re high contrast and easily differentiated, they’re quite small in comparison to the rest of the tile. Well contrasted, but quite small. That’s not necessarily a major problem given the availability of magnifiers and smart phones with assistive tools, but given that they will often be located in a dense clump of tiles that cannot be easily disturbed it can be a little awkward. Sometimes tiles will be obscured by sand markers, but these can be lifted out of the way if necessary to look at what’s underneath. For most situations once a tile has been flipped it’s usually not necessary to keep track of it afterwards save for clues and tunnels. 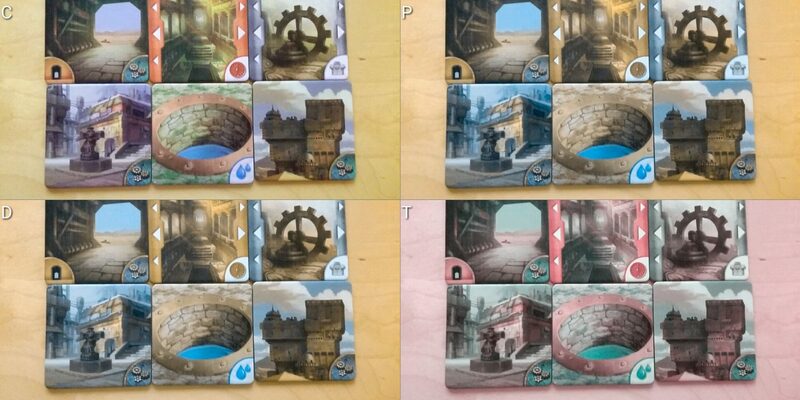 Forbidden Desert is a co-operative game and ideally there will be people at the table able to give guidance as to what the different tiles represent and where it’s necessary to go to meet goals. It’s not great for personal agency, but you can rely on the people around you where possible to help deal with things that can’t otherwise be identified. More problematically, the clue tiles require the following of the intersection of rows and columns potentially across the whole board. Again, these issues are often alleviated by co-operative games but for those with visual impairments it might be difficult for them to ascertain for themselves where parts need to be placed or when they’ve been found at all. When they are placed, there is an agreeable degree of asymmetry to each of the parts – they’re all different colours, different sizes, different shapes, and in for the engine an entirely different material. There’s no need to worry about being able to keep of which parts are on the board or in the machine – it’s easy to tell the difference. 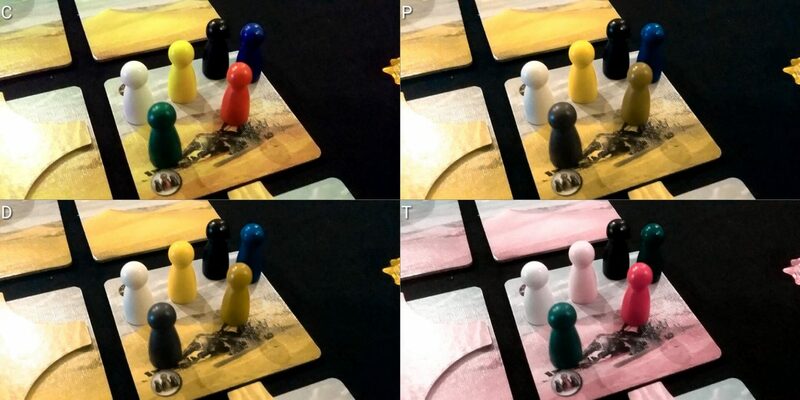 Again, we can recommend Forbidden Desert for those with visual impairments. With some small compensations, we believe it could be played well in a co-operative session provided there is at least one person that can deal with the occasional visual ambiguities. There’s very little necessary text in the game – the roles are the only things different for each player, and otherwise everyone shares a core of actions that remain constant. There are few exceptions in the rules – very few situations of ‘if X then Y except when Z’. Once a role is learned, it remains learned and applicable in almost all game situations. That greatly reduces the cognitive complexity that comes along with learning the game, and with playing the game. Similarly, there is little obvious requirement for significant memory management – all the key information is available for interrogation, whether it’s what clues have been found, what parts have been identified, what parts have been found, and how much water everyone has. Even the history of the storm is freely available for people to look through if they need a reminder – the rules explicitly make provision for looking through the discard pile at any time. The equipment cards contain short and unambiguous declarations as to what the items do, and they have a consistent use pattern – play them, discard them, gain the effect. 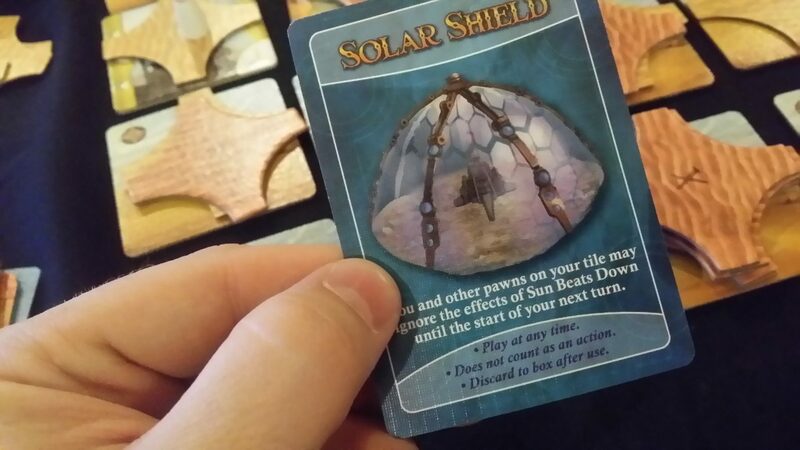 Some of the effects may be a little hard to keep track of (for example, the solar shield) for people with serious cognitive impairments, but if there’s anyone at the table that can keep track of effects that last beyond the player’s individual turn it’s not a problem. The game flow remains consistent throughout – four actions, draw storm cards, and repeat. Unlike games such as Pandemic where the game flow may become highly complex depending on the order in which cards are drawn from the player deck, Forbidden Desert has only a small handful of deviations from the norm in the way cards are played. When the Storm Picks Up, we move on the storm track rather than move tiles. When the Sun Beats Down, we move down our water tick marks rather than play tiles. But it’s always ‘Play a card, one thing happens’ rather than ‘Play a card, this happens which causes this to happen, which causes this to happen’. Scoring is trivial – if you have all four pieces and make it to the launch pad, you’ve won. There’s no end of game scoring – it’s a pass/fail system. We recommend Forbidden Desert for those with mild to moderate cognitive impairments. 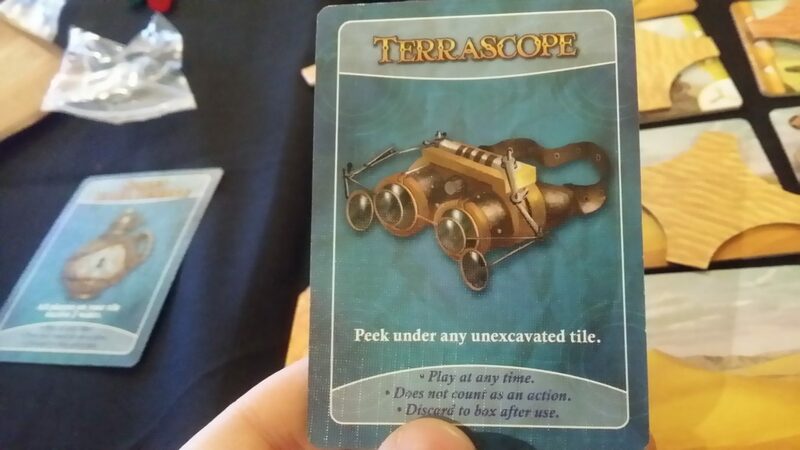 For those with more severe impairments, we would recommend Forbidden Island as a game which is very similar, but has even the little complexity of Forbidden Desert mostly stripped out. We’ll eventually do a full teardown of Forbidden Island, but aside from some issues regarding card management the likely outcome will be ‘Like Forbidden Desert, but easier’. Forbidden Desert is a despair engine, like Pandemic and Galaxy Trucker. That raises issues of emotiveness. Like Pandemic it’s a co-operative game and so everyone fails or everyone succeeds. You are almost certainly going to lose the first few times you play it, and the failure is compounding – it gets gradually harder as you go along, making you feel as if you’re losing control of a situation on which you once had a handle. That’s a very agreeable state for a game like this, but may not play well with certain kinds of emotional control issues. The failure compounds, but it does so relatively gradually. In Pandemic, it’s possible to flip over a single card that turns a controlled situation into a guaranteed loss – the wrong outbreak in the wrong city can cascade beyond any ability to contain. Forbidden Desert has that same basic system, but it’s far more incremental – sand inexorably accumulates, it does not suddenly blossom out in vast networks that are only going to chain together. The storm picking up happens in the next turn, so you have some time to mitigate its effects. There are equipment cards that can help manage the situation, and they’re more abundant than those available in Pandemic. Water loss is (mostly) incremental – it’s possible to draw multiple Sun Beats Down cards in a row, but relatively rare and even that can be a blessing in itself if it happens early enough – it means you’re less likely to encounter thirst as you progress through the deck. Sand dunes in Forbidden Desert share certain familiarity with disease epidemics in Pandemic – they don’t work well if there’s a need for closure, because you can never get rid of them. There will always be more sand, and it’ll always need more effort to clear than you can ever really devote. You need to be able to deal with compromises – you need to be able to ‘clear just enough sand’. There are some issues particular to Forbidden Island that need to be considered without how they relate to Pandemic. The first is that Forbidden Desert is a game where you can be actively prevented from making the progress you want. You might need to reach a tile to get to a part, and find that a storm blows both you and the part farther away, while building up a bank of sand between the two of you in the process. That’s a mechanic I love, but it’s also one that can be frustrating especially in the later stages of the game when you feel like you just can’t waste a single action. As in the review itself, there’s also a degree of cruelty built into water management – it takes a lot of work to get enough pawns onto an oasis square to make it worth flipping over, and sometimes the reward for that will be ‘haha, it was a mirage’. To be fair, there are pieces of equipment that can prevent this outcome by allowing you to look under unflipped tiles, but they in themselves can be frustrating to use. 66% of the time it’ll reveal an oasis, and sometimes all they’ll reveal is that you should have trusted the odds. That can feel like a waste. I can see through your soul with this. And your underwear. Co-operative games mitigate a lot of potential emotive issues because they remove the string of saying ‘I lost’. Instead, it’s ‘we lost’. That’s good, because that’s what you’ll spend most of your time in Forbidden Desert doing – losing. It’s good to know you’ve got company. We’re willing to recommend Forbidden Desert in this category too, with the usual proviso of ‘your mileage may vary’. It depends so much on the group, the behavioural conditions being considered, and the way the deck plays out, and only you can know how the first two will manifest. 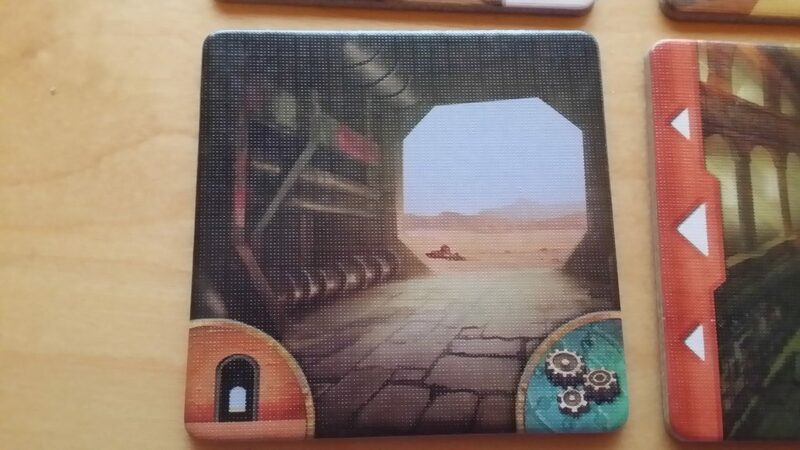 There is a lot of tile and marker manipulation in Forbidden Desert. There’s moving the tiles in relation to storms, flipping them over, moving the tick marks for water and the storm, slotting the pieces into the machine, and moving the pawns. It is a very tactile game, and while none of it requires someone with impairments to be making the moves, it’s never an ideal state for us to say ‘someone else can do this for you’. Co-operative games are great for this if there are mixed-capability groups playing, but if you have a group in which everyone may have a physical impairment it’s not appropriate to recommend it. Its recommendation is contextual on you having someone that can do all the fine movement. It might be a little more difficult to refer to arbitrary tiles, since they have no distinguishing markers for the most part. ‘Put me on the third tile from the bottom’ could mean anything depending on who is looking at the board at what angle. By adopting a grid reference system though, you could even eliminate the need for that – ‘Put me in tile A3’. The game doesn’t come with any such markers, but you can easily jury-rig your own. There are cards in the game, but they are played face up and there are rarely enough of them to cause physical distress in hand management. Our usual recommendation of making use of a card holder remains true here, but it’s unlikely to be necessary in most cases. 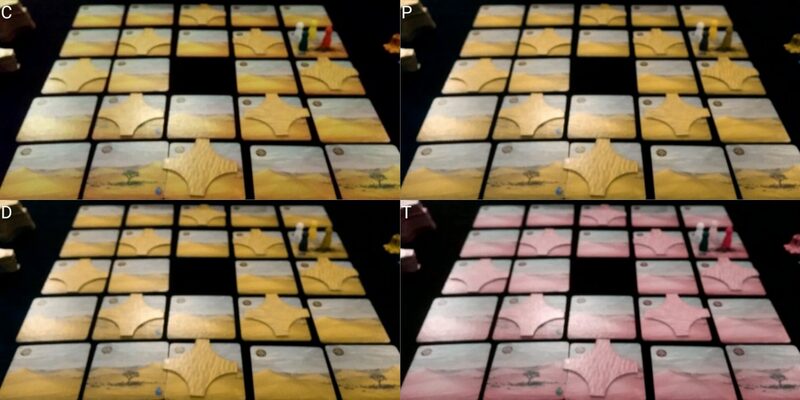 As with Carcassonne, the nature of the tiles in Forbidden Desert can easily create alignment shockwaves – luckily, it’s nowhere near as significant an issue because you rarely have them lined up in a way that is important. The board does rapidly become very untidy though, and if it’s left too long there may be some minor issues of alignment that make their way into play. That’s especially true if tiles are being manipulated by someone unable to finely position the various parts. The tick symbols in particular are tiny and fiddly, and must be attached to individual cards each game because they are not built in to the pieces. It’s easy to drop them, and very difficult to find them again because of how small they are. However, they’re just a way of acknowledging how much water you have or how many storm cards to draw – you can easily make use of a sheet of paper, or an electronic assistive aid, for either of those. We’ll tentatively recommend Forbidden Desert, on the important assumption that it’s being played in a mixed-capability group with at least one person that can handle the manipulation of tokens. Otherwise, we would advise you stay away. As a co-operative game, discussion about strategy is often an important and integral part. With Forbidden Desert, the decisions all resolve down to ‘what’s the best way to excavate’, which means that there’s not a lot of complexity to discussion although you’d be forgiven for thinking otherwise. In many ways, it’s a bit like Deal or No Deal in which you might think that the choice of box is important but over the long term it all resolves down to ‘you have an X% chance to get Y%’ regardless of which box you pick. There are four sites that have guaranteed outcomes – the crash site always yields a piece of equipment, the three oases always yield water or a mirage. For the rest, you’re just playing the odds based on what you’ve found so far. So, discussion of strategy tends to be ‘how do we maximise our efforts here’, and that conversation doesn’t need to be particularly difficult or complex. ‘The storm is in the north, so let’s clear the sand in the south and explore there’. Or, ‘I’m the water carrier, so I’ll keep everyone hydrated while you search’, or ‘I’m the archaeologist, so I’ll focus my effort on cleaning sand while you guys excavate what you can’. There are some parts of the game that require familiarity with the English language, but it’s not much – each of the equipment cards in particular come with a very easily identified icon that you can link to its effect, and the effect is normally reasonably intuitive. A jetpack lets you move anywhere unblocked. 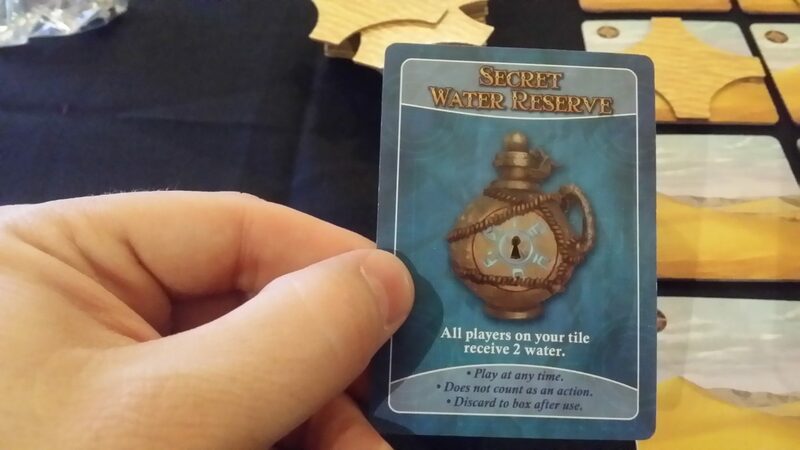 A water reserve gives people on your tile a couple of mouthfuls of water. It’s possible to memorise, or if that wasn’t an option you could easily make use of a small crib sheet. Similarly with the roles in the game – they are relatively easy to understand and easily memorised. There’s rarely deep conditional complexity that you need to communicate or understand. Strongly recommended in this category if you can ensure that someone is on hand to explain text to those that may not be able to read it. For me, the only potential thing about the theme is the implication of the looting of antiquity that goes with the whole concept, We’re heading into some unknown land to take treasures for some unknown purpose. I think you need to reach pretty hard to arrive at that conclusion and be even vaguely troubled though. I bring it up just as a potential issue, because the looting of cultural heritage is an important and unfortunately legacy of Western imperialism and is understandably a topic of some distress to certain groups. There’s nothing explicitly in the theme that mandates that interpretation – perhaps you’re a group of local archaeologists heading in to a site of cultural importance in your own nation for reasons of antiquarian preservation. For the rest of the game, it gets a clean pass – the language is non-exclusionary, there is no gendered or ethnic characterisation, and the artwork all relates to an agreeably non-specific culture that has no obvious parallels with any individual Earth society. It all looks too mysterious and steampunk to be an obvious real-world cultural reference. Economically, I cannot at all fault the game – it’s very cheap for what you get, and the production values are top-notch. I suspect it doesn’t have a huge amount of replayability given the limited tactical or strategic choices you get, but we’ve played it a good half-dozen times or so and it’s still in the rotation. Strongly recommended in this category. There are intersectional issues regarding those with combined visual and physical impairments due to the way the board is manipulated and explored. If you need to get up close to see the symbols in the corner of the tiles, a physical impairment may make that difficult or impossible. Similarly, even tiles that are currently in use may end up covered in sand, meaning that if you want to see what’s underneath you need to move the sand out of the way, read the tile and move it back – all of those things may be made more difficult for intersectional conditions. The board is non-contiguous though, so it’s possible to arrange it in a way that may be more comfortable for everyone – it’s even possible to do non-standard layouts, but these will have a dramatic impact on how a game actually plays out. Quarterbacking is hugely reduced in Forbidden Desert, but the ability of other players to play for you remains intact – nobody can tell you the optimal strategy for your turn, but they have access to all your state information if it’s necessary for you to drop out. The game length is a well-formed 45 minutes, which isn’t so long that it will exacerbate distress, but long enough that distress can potentially be an issue. Forbidden Desert manages to navigate this area extremely well, enabling agency while also permitting meaningful drop-in and drop-out. For those with visual and physical impairments, there are likely to be issues manipulating the tick markers on your card – it’s hard to see the tick markers, and harder to manipulate them. You’ll likely need either someone to do it for you or make use of an alternate form of representation as discussed above. There are no hidden hands in the game, so there are no issues of physical/cognitive intersectionality that come into play. The only randomness is that which is contained within the deck. That alleviates the problems we’d tend to find associated with dice-rolls. There are a lot of tokens and markers, but they all tend to be of the same kind so there’s no complex memorisation required for those with visual and cognitive impairments. 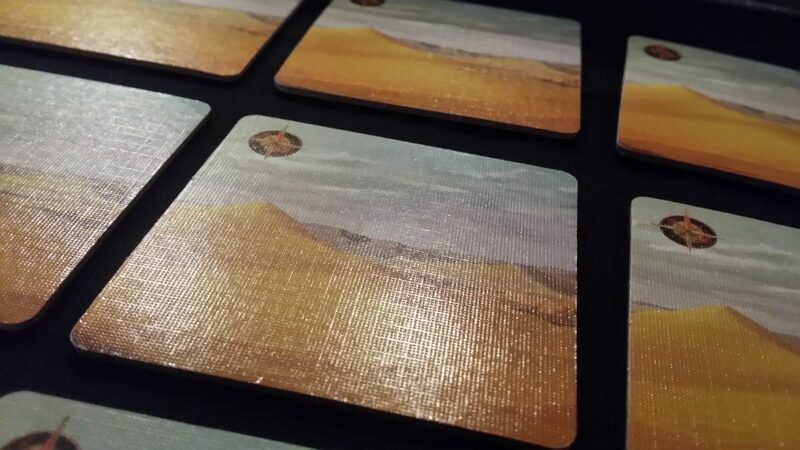 Forbidden Desert is one of the few games we’ve encountered that we’d recommend (albeit tentatively for those with physical impairments) to almost anyone. It does however get most of that as a result of its co-op nature – the scores would be much less encouraging if this were something played competitively, so it’s important to bear that in mind. It scores well in almost all categories, but it does so with the understanding that there is someone in the team that can compensate for the problems you will encounter. Perhaps the best thing about Forbidden Desert’s design is how much of it is so tactile – not in terms of the manipulation of pieces, but in terms that the physical layout of the board mirrors the game state. You don’t place a ‘two sand’ marker on a tile, you place another marker on top of an existing one. That is both a useful reminder, a nod to theme, and something that can be physically queried by those with visual impairments. You can finger a stack of sand markers and say ‘Wow, that’s a lot of sand’. Similarly with the pieces – I’m not sure how they manage to have tokens like that in a game that is so affordable, but it adds a lot to the immersion and the accessibility to have such physically distinctive tokens that people can examine. We gave Forbidden Desert four stars in our review. We think almost everyone can play it in a suitable group. So, why not go out and buy it? It’s great.